I've never been so confused about deciding a bus to travel in. It was a tight competition between multiple operators. My needs were simple - a mid-afternoon departure from Thrissur, and a pre-midnight arrival at Bangalore. The options were plenty. But then, the curiosity to try a new operator weighed over other factors. 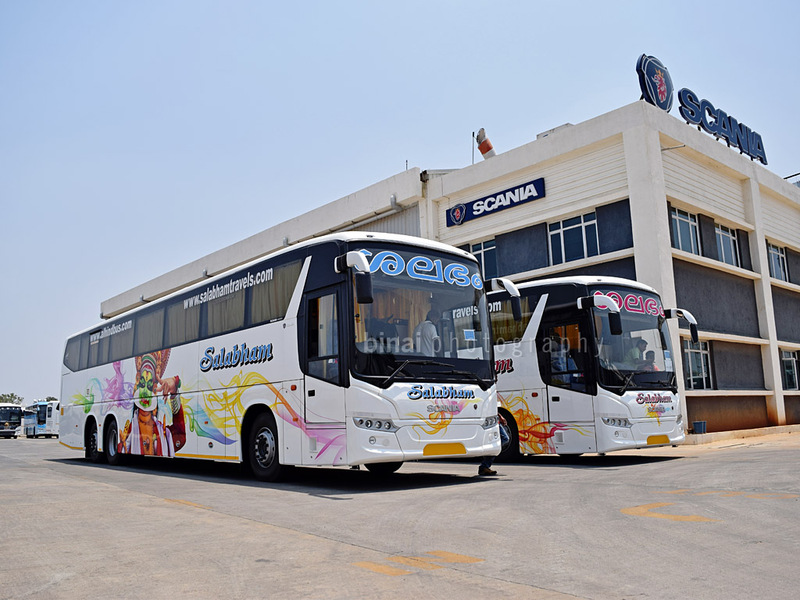 After a lot of thinking around, I decided to book on the new Salabham Scania. The Salabham website had some error and the seat layout never loaded properly. I ended up booking on RedBus later. 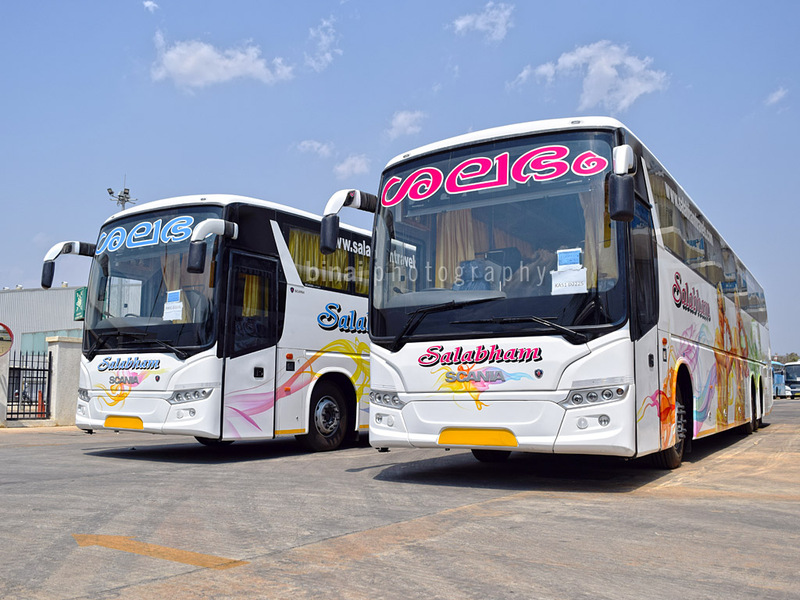 One more shot of the pair..
Salabham is a famous tour operator based in Chottanikkara, near Ernakulam. These new Scanias mark their entry to the regular tour operation segment. They took delivery of two Scania Metrolink HD 14.5M coaches on April 02, 2016. 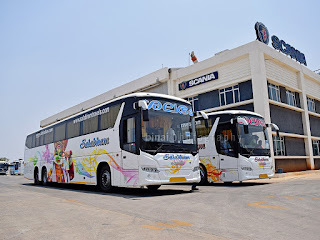 These buses have a distinction of being the first in the industry to bear airbrush art graphics. The buses bear graphics of two famous art forms of Kerala - Kathakali and Mohiniyattom. The art work was done by a famous Thrissur based artist, Mr Zini Raju, who specializes in airbrush art work on vehicles. The buses look amazing with the portrayal of Kerala's own art forms. And it looks even great with the Malayalam stickering of the operator's name - I personally love that! I booked the ticket at around 0915 in the morning - for a bus that departs from its origin at 1200hrs. I opted for a window seat around the middle of the bus on the right side (#F1). As the time came closer, I started feeling heavy at heart - its always a depressing moment to leave home. 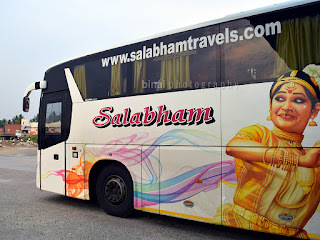 Sometime around 1200hrs, I received a call from Salabham, informing me that my bus would be delayed by an hour, and is expected to reach Thrissur only around 1600hrs (Original time 1500hrs). I was elated for two reasons - an extra hour at home, and the fact that they called up and informed, and I did not have to wait endlessly for the bus on the roadside. I got even lazier, and left home a little late. It was 1415hrs by the time I left home - it took sometime for me to get a bus, and I made it to Thrissur only 1535hrs. By now, I received no less than 5 phone calls from the Alhind office in Thrissur enquiring my whereabouts (Alhind is the operating partner of Salabham). I felt sorry for making the co-passengers wait for me. When I reached the Alhind office, the guy who was calling me was standing on the roadside waiting for me - an airconditioned taxi was waiting as well. Three other passengers were already in the car. I squeezed in, and we headed towards the actual point where the bus would arrive - Mannuthy bypass. We got to the pick-up point by around 1555hrs - the taxi guy dropped us on the road side and headed back to the city. It was hot and there was no shade around. But then, the wait did not last very long. The bus turned up 1604hrs. The bus that would take me back to Bangalore was KA-51-D-2225 - the one with drawing of Mohiniyattom on its side. With only 36K kms on the odo, the bus felt very young and energetic. I headed straight to my seat (#F1) around the middle of the bus. The crew quickly did a headcount and verified seat numbers, and we were off at 1606hrs. Some Tamil melodies were being played at a very low volume. The driver showed sense of urgency - but he was under good control. No risks were taken and well planned overtakes were executed with ease. The cabin temperature was very comfortable - not too cold, not too warm. I tuned to some music on my phone and relaxed for most of the time. Traffic was on the higher side, and we had to move slow for most of the time. The driver let the beast loose after Vadakkencherry. I recorded the run for quite some distance on my phone GPS - the top speed recorded was 98kmph, with the average being around the 80s. The bus took the flyover at Palakkad (1716hrs), and continued gunning down the highway. The 4 lane highway is really helping buses cut a lot of running time these days - with completion of the Mannuthy-Vadakkencherry stretch, we can expect running time to come down heavily. The speed reduced as we passed Walayar (1730hrs) - the road narrowed down, and the surface would put the moon to shame - large craters, big enough to hold a bus, kept showing up time and again. The driver kept the ride as smooth as possible - and it was really smooth inside. We lost quite some time by the time we reached Madukkarai (all thanks to the poor roads). 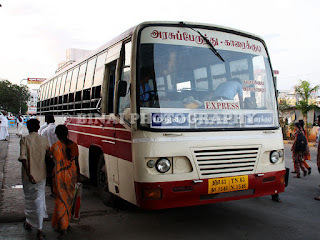 The driver picked pace once past Madukkarai. We pulled into a fuel station just before Neelambur (1816hrs) for refueling. The unique design of Scania's fuel tanks mean it takes much longer for a refuel than a Volvo. They need to refuel both the fuel tanks seperately - unlike Volvo where you can fill all the three tanks at one go. The bus was pulled out, and then parked again to gain access to the tank on the other side - wasting a lot of time. The art-work is just awesome! While refueling, I spoke to the crew - who were quite excited to drive the monster. There were three drivers and an attendant on board. 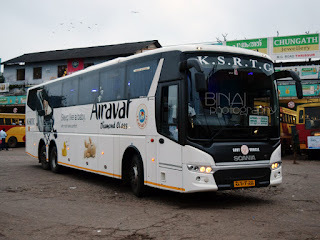 The bus was operated a special trip the previous night, to Trivandrum, and got delayed due to heavy rains. This was the reason for the delayed start of this trip. The bus had a full sized berth at the end for the spare driver to sleep - a really nice thing, taking into account safety of the passengers. We started after refueling at 1836hrs. We stopped again near Neelambur toll gate for pick-up (1845hrs). This stop also doubled up as a tea break for the passengers already on board. The crew had their refreshment really quick, and we started off again at 1858hrs. Once back on the 4-lane highway, the driver picked pace very fast. In the meantime, a movie was played. They kept the volume low, so that people who wanted to sleep could do so. I remained glued to the movie for most of the time. We did not have any pick-ups on the way. 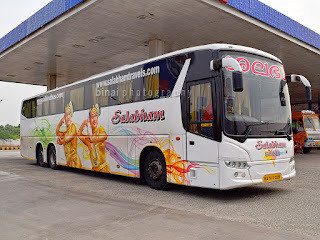 We pulled in for dinner at Hotel Saravana Bhavan, past Vaigundam Toll Gate, at 2030hrs - the place was already crowded, with about three buses already taking their dinner break (including a Parveen Travels Mercedes Benz). I knew the hotel would be very crowded, and hence rushed in - thankfully our bus wasn't full, and hence the hotel still had place. I had my dinner quick and returned outside - by now two Kallada buses had also joined for dinner. It had slowly started to drizzle by now - the crew rushed back to the bus, and opened to door so that passengers could sit inside without getting wet. They had locked the bus when passengers got off for dinner. We started from this place at 2100hrs. The driver changed at this point. This guy was more aggressive - but very controlled. I was very sleepy by now, and prepared to sleep for some time. We passed Salem at 2128hrs - it was raining really heavy here. I slept for sometime after Salem - not a continuous sleep, but intermittent bouts of sleep. I couldn't sleep well because my mind was already tuned to get off the bus around midnight. Traffic was on the higher side after Salem - lots of trucks on the road, and we lost pace everytime we reached a ghat section. The toll gates were crowded as well - Krishnagiri, particularly, was a mess. We passed Hosur at 2353hrs. Attibele toll was again a mess - it took over 5 minutes to pass this place (0006hrs). I pulled up my backrest as we passed Attibele. Electronic City toll was reached at 0018hrs - I was quite surprised to see around 5 people join the bus here. We started again at 0022hrs. I headed to the cabin as we entered BETL. I also confirmed a taxi using an app around the same time - so that I wouldn't have to wait for long after alighting from the bus. I finally alighted at Silk Board flyover, at 0030hrs. The bus was really well kept. The interiors were really clean, and the blankets felt very fresh. The exteriors were dirty - the bus was delayed and hence they didn't have time to wash. The drivers were really good - amazing driving, controlled aggression. The attendant seemed to be in his own world though - never bothered to pull down the rear LED panels, or adjust the volume. He hardly got up from his place to call out passengers alighting at different places. The loads were very low (hardly around 12-14 passengers). The end-to-end running time turned out to 8h24m including about 63 minutes lost in breaks. Amazing run times! Although the bus was delayed at start, I give full marks for the courtesy to call up the passengers well in advance and inform them of the delay. Charging Point: Available, remained On throughout. Will I take this service again? Absolutely! Hello Binaieta, Recently I was checking tickets from Bangalore to Coimbatore for a friend of mine and found the fare of this particular travels at INR 800 which was quite high compared to other operators. I found that a lot of seats were vacant too. What was the fare you paid for your journey? Was it same as that of the competitors? 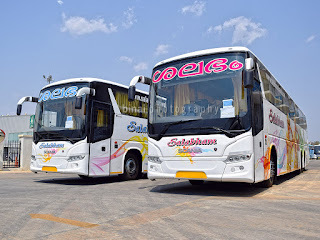 @Rahul Vijay.. the Kerala-Karnataka fares are governed by association decided rates now. No operator is permitted to under charge or over charge. Its now Rs. 1150 fixed on weekdays for BLR-Plkd/TSR/EKM sector. There is no control on the cut seats in the other sectors. 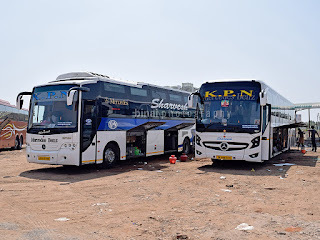 Thanks Binaieta for the useful info...Finally my friend booked in a KPN Multi Axle Volvo with fare of INR 520! The app cab! A taxi war in Bangalore!